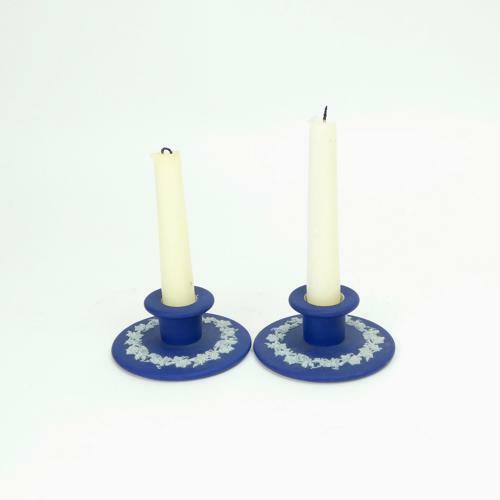 A small pair of Wedgwood, dark blue jasper dip, chamber candlesticks. Both candlesticks have impressed marks 'WEDGWOOD' and 'MADE IN ENGLAND' and they date from c.1920. They also have a small mark in the shape of a Y. This is an unusual shape and size of candlestick to find from the 1920's as it is usually associated with Wedgwood's later productions. They are decorated with a single band of grapes and vines around the bases. The reliefs are good quality and the jasper dip is a rich shade of blue. They are both in excellent condition.